Toilet paper and paper towels cannot be recycled. 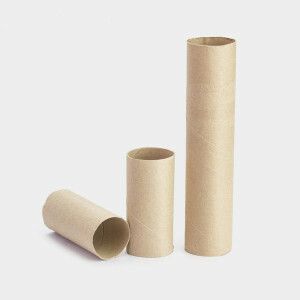 Make sure that only empty rolls are recycled with cardboard. Empty toilet paper rolls often never make it into the recycling bin because they get mixed with garbage. Make it easier to recycle these tubes by placing a small recycling bin in your bathroom/s. Kimberly-Clark brand Scott is now selling tube-free toilet paper. If you join their campaign, Scott will send a coupon for this tube-free toilet paper. An empty toilet paper roll can help you store electrical cords. Just fold up the cord, stick it inside the tube and put it away. Keep all your hair bands together by wrapping them around the empty cardboard tube. It takes 27,000 trees every day to make the world’s toilet paper supply. Americans buy over seven billion rolls of toilet paper each year. The most popular designs for customized toilet paper are sudoku, money, camouflage and glow in the dark.